The triansistor power section is as pictrure as the one posted, made by 6 nos of 2N3055 triansistor, both T1 and T2 are to be made identical, and if you want mosfet, then use P55NF06 mosfet, having 3 mosfet parallel, with each one having a resistor of 22 ohm in series to the Gate pin to the T1 or T2 base point. The transformer is costly, better build it yourself or by any local transformer repair shop by an old 750VA~1KVA stabilizer transformer. The primary wire guage is 13 swg, and secondary is 23 or 22 swg. The main feature of this inverter is, this is a PWM based circuit, and output voltage stables at any load, same thing that happens to SMPS. April 7th, 2011 at 4:24 pm@sunny, rewind transformer. do u have any idea about that…. thank you…waiting for your valuable reply….manu. October 24th, 2011 at 1:50 pmFree energy from magnet? Sounds impossible. Can you describe it to me? November 3rd, 2011 at 6:08 pmHello Friend, please give the circuit clearly, I can not understand the circuit because of very small size, I want to make that type of inverter, so please help, if you send me clear circuit to my mail address ([email protected]), this will be very helpful to me. Hello Friend, please give the circuit clearly, I can not understand the pwm inverter circuit diagram because of very small size, I want to make that type of inverter, so please help, if you send me clear circuit to my mail address ([email protected]), this will be very helpful to me. May 20th, 2011 at 9:06 pm@Dhrubajyoti Dey, I have repaired the link. You can click on the image to see larger size. November 2nd, 2011 at 6:26 pmClick on the image. dear Friend, I just want to know that did u test or make this inverter with 12v lead acid battery ? I have made many transistor inverter with 74LS112 IC Board. Does this SG 3524 ic oscillation circuit is better than that ? Dear Friend, I can not seen any preset to adjust the frequency or inverter output Ac voltage. Is it fixed, which resistances are substitute of those preset ? May 22nd, 2011 at 8:48 pmThe frequency is fixed to 50Hz. May 22nd, 2011 at 9:09 pmDear Friend thanks for your pompt reply. 50hz. is fixded that is very good, but transistor output ac voltage is also fixed i think. how can i change this, whats the voltage you fix for the circuit. actually i need output voltage 240volt, so i ask you. May 22nd, 2011 at 9:25 pmAt output, there is a 200K resistor, just replace it with 220K valued resistor to get 240Volts output. dear arup, at first circuit, Base and emitter pin is connected with a 100ohm resistance of T1 and T2. My question is that is this only for amplifying the gain and for the first transistor or this continues with all the transistors ? If you give a total circuit picture with all transistors, then it will much better for me and easier to understand. If I will make this circuit with mosfet will it better than transistor ? please give a circuit with all mosfet and connection. May 23rd, 2011 at 12:33 pmMosfets are definitely better than transistors. For your need, I’ll publish an article of PWM mosfet based inverter shortly. Stay tuned. Dear Arup, Please try to post a oscillator circuit with SG3524 with mosfets as early as possible. I have to build an inverter very quickly. Thanks in advance. June 4th, 2011 at 7:36 pmI have sent you the diagram by email. Didn’t you received it? June 7th, 2011 at 4:13 amThanks for your cooperation. I have got it. June 16th, 2011 at 8:57 pmNo frequency change needed. The circuit is already set to a fixed 50Hz which would be accepted in all appliances. I’ve noted your request of changeover circuit and will publish it after a few days. And, LM317 is a voltage regulator IC, not a charger IC. For quick notification of the publication of your required post, I’d advice you to subscribe to updates by email through the box above. And yes, thanks for dropping a comment. Happy to see you found this useful. 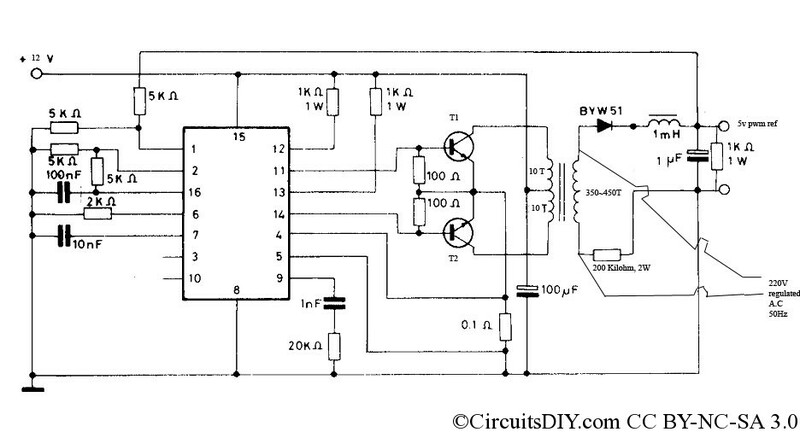 This circuit is very good and easy to made. I request you to please send me a oscillator circuit with SG3524 with mosfets. August 11th, 2011 at 10:34 amUse this same circuit. Just use MOSFET instead of the paired transistors. August 12th, 2011 at 7:18 amMicrocontrollers! Hmm. A good idea to easily make sinewave inverteres by generating sinewave by PWM, or D/A ladder. Thanks for the idea. I’ll soon publish a circuit, program and article for MCU based inverter. Stay tuned, Stay subscribed to get notified. Dear Arup, 220V output is shown OK, but what about the 5V PWM reference wires? Where do they go? Please clarify. Thanks. September 25th, 2011 at 12:54 pmYou can see 5V PWM reference wires comes from a resistor based voltage divider from the output and goes to SG3524IC. October 1st, 2011 at 4:06 pmNormally we get 20% to 70% duty cycle or PWM from SG3524. But the absolute range is 0% to 45% for each channel that means total 90% max PWM. well i’ve been working on inverter for last 4 months, Arup can you plz tell me what is the function of those 6 transistors in power section connected to T1 and T2? I know that we take supply from the all the bases of the 6 transistors which is further connected to transformer, but if T1 and T2 are switching the pulse then what is the function of those 6 transistors? 750VA UPS is nothing but a complete inverter. You can see a complete circuit for the same in my blog. Thanks. The switching pulses have to be amplified a lot to drive the transformer. It would be best if you buy a ready-made inverter transformer. I have made transformers, and believe me, it’s a dirty job. so is it a voltage amplifier circuit or power amplifier circuit? moreover my amplifier circuit works in common base configuration, which configuration I should use for those transistors which will be used for switching pulses? October 7th, 2011 at 8:53 amUse them as darlington pair for high gain. Hello how is everyone good to know there is a forum like this where we can get such a good circuit. Mr Authour I would like to know what kind of output wave form this circuit produces. Is it modified sine wave . I would like to build it , thank you waiting for your reply. October 8th, 2011 at 6:25 amHi, this is a blog and not a forum. Modified sinewave requires fixed 50% d.c in PWM. In this circuit the PWM varies to compensate the load. SO it’s not a modified sinewave, but it will act like sinewave if you use larger capacitor at output. If I connect them in darlington pair still I would need step up transformer? If yes then what is the advantage of using darlington pair over common base configuration (cascade) ? October 12th, 2011 at 2:42 pmAdvantage of darlington: High gain(hfe, or beta).Transformer is much in any kind of such inverter to boost voltage. Pls, how can i use my inverter transformer to charge my inverter battery and together with the relay as well. And while is my inverter transformer is making small noice when connected to battery although is working? October 22nd, 2011 at 3:37 pmSmall noise is fine. Just disconnect power supply(+ve) to controller board and connect AC mains line to output of Transformer and it will be in charging mode. Pls, how is bicycle 6vac or 12vac dynamo work. Can it work for 15 hours non stop? October 24th, 2011 at 1:48 pmYes. But you need proper lubrication. October 27th, 2011 at 3:26 pmWash battery and reinstall Acid. Can someone convert 12vdc produce from dynamo to AC, If not why? November 4th, 2011 at 3:31 pmYes we can. We’ll require a DC motor and AC dynamo. I made some solar panel by my self and i bought some ready made inverter ,and i want to make one follwing your sircuit. I already erdered some components. Does this sircuit has a fuction of overload , and if not can this be done with a optocoupler . November 15th, 2011 at 5:12 amYou can detect overload the same way output is measured. You need to trigger a transistor in case of overload and that transistor will switch the shutdown pin (pin no 9). Tell why we use regulator 7809, not 7805 or ..12. November 15th, 2011 at 5:11 amWhere 7809 is used? November 15th, 2011 at 12:17 pmShow me where in the above circuit a 7809 is used. Good work Arup, please tell me is the transformer is a 12-0-12 center tapped transformer. Also i intend to use mosfets, if i replace P55NF06 with IRFZ44N will the gate resistance remain 22ohms, if not what value is it? Does the 100 ohm base at the mosfet gates remain constant in this case? Also what is the wattage of the resistors and capacitor voltages. November 25th, 2011 at 10:34 amYes 100ohm resistor is common at the GATE of the MOSFET. Please send me the full circuit diagram to my mail. Yes, you can, but if output power is over 250watt, the heating will be an issue. I have 70 Ah battery I want to use SMPS inverter for CRT TV. which circuit is good for it.And also I used charging for that battery is used with solar now.also I want inverter dc 12 V to 220 V ac is with ferrite core because of I have. please send me the complete circuit diagram of the inverter on how to connect all the mosfet and transistors. I try building it but don’t understand how to connect either mosfet or transistors. my email is [email protected]. We don't spam, seriously ! Copyright © CircuitsDIY · All rights reserved. Useful one ? Share it !